We planted hard red winter wheat. Hard wheat is used to make bread flour; soft wheat is used to make pasta flour. Winter wheat is sown in the fall, it goes dormant over the winter, comes back up in the spring, and is harvested in the late summer. Some of the issues we had with this experiment had to do with boggy fields, cheatgrass, pests, and the timing of the harvest. We had a very wet spring, and we learned that the wheat field wasn't a particularly well-drained field. However to its credit, the wheat grew fairly well despite the boggy sections, which of course dried out once the rains stopped in mid-June. The other major issue we had was cheatgrass. Here you can see the field in August, with the wheat thoroughly invaded by cheatgrass. But despite that, what wheat we had looked beautiful. The only way to harvest wheat on a small scale is to use a scythe. Here Don is taking some experimental whacks. These experimental swings with the scythe were done on August 6. What we didn't consider was August is the time of year we're screamingly busy with our home business. So the next swing of the scythe didn't happen until August 15, which is when I took over. It was brutally hot out, and I was wearing a thin muslin cape I use in the summer in lieu of sunscreen. It keeps the sun off my neck, chest, and shoulders while staying loose and cool. I learned a scythe isn't hard to use, when done properly. In fact, it's rather soothing and gratifying to feel the stems of the wheat cut like butter before the blade. The blade must be kept very sharp, of course. And the trick is to let the weight of the scythe do the cutting -- you don't arm-wrestle it. It's hard to tell from this photo, but the wheat is lying in swaths, sort of. Unfortunately the cut wheat is not all facing the same direction. Here the girls are pitching the cut wheat into a wheelbarrow to bring into the barn. By this point the wheat was probably TOO ripe, which meant it had a tendency to "shatter" -- the heavy seed heads snap off and fall to the ground. In fact, so many seed heads fell off (don't worry, we raked them up) that it's easy to see why gleaning was such an important part of the biblical economy. Collecting the heads by hand could yield a nice bounty. For the time being, having no other place to put it, we stuffed the wheat into Matilda's pen. Stray grains were happily snapped up by the chickens. The above photos were taken on August 15, then once more life got in the way. We were working insanely long hours on the business, plus I had a fast trip to Florida, plus a nasty heat wave hit our region, plus the barn was being built, plus we had to move hay bales, so the harvest attempts didn't resume until August 25 -- and then only in the late evenings after the sun went down. It was devilishly hard to find time to do much with the wheat, considering our work schedule. But we tried an experimental threshing session where we got two clean tarps, put the wheat down between them, and stomped around quite a bit. It didn't work half badly, but it took time. And time was something we had very little of. At this point, most of the wheat was scythed and collected and stuffed in Matilda's stall for the time being. We just didn't have time to thresh it. We had tankards to make and very little time in which to make them, so the unthreshed wheat stayed in Matilda's stall. And then we heard it. Rustles. Day and night, whenever we went into the barn, we kept hearing persistent, constant rustles. Gradually it dawned on us we weren't hearing rustles, we were hearing nibbles. Yes, the chipmunks had discovered our wheat. And they nibbled, nibbled, nibbled at it until it was all gone. Chipmunks, we learned, are nothing if not wildly efficient. And we have hundreds of them around here. So we lost the wheat. You might say we were cheated by cheatgrass and chipmunks! That's what it comes down to. Now before you all start saying what we should have done in terms of saving the wheat from the chipmunks, consider how many of you have the energy to thresh wheat after working twelve to fourteen hour days, seven days a week, in 90F temperatures. Just a thought. 1. Choose a different location to plant the wheat. We're thinking on fencing off a one-acre portion of our pasture, which is sloped and therefore better drained. 2. Plant a hard red spring wheat, rather than a winter wheat. This means we can plow under any growing cheat grass several times before we plant the spring wheat, which around here is planted in the first couple weeks of June. With this in mind, we needed to get more seed wheat to plant next year. So in mid-September, I went to a farmer's coop and purchased treated hard spring wheat (not winter wheat). This wheat is known as DNR (Dark Northern Red). The fellow poured the bin of wheat into a hopper for sacking. He slipped a bag over the hopper bottom, which is attached to a scale. The hopper automatically stops pouring wheat when the scale reaches 50 lbs. The hopper gizmo had a built in sewing machine for sewing shut the sacks. Spiffy. So here is our 200 lbs of DNR spring wheat. We'll plant it next June. As you can see, life on a homestead doesn't always go smoothly. Things get busy. Mistakes happen. Though we didn't make a single loaf of bread with this wheat-growing experiment, we learned what worked and what didn't. We learned our strengths and our weaknesses (such as having our busy season coincide with harvesting wheat). When one door closes, another door opens. Have you considered eating the tiny wheat thieves? LOL Well, wheat converted to protein isn't a bad trade-off. It's difficult to refrain from offering advice because it's so painful to see the wasted energy and money you expend on these experiments. However, experience is the greatest teacher, so it will all work out. My biggest concern is that we are all running out of time for experimentation. The news around the world is bad and violence is growing everywhere. We have to prepare quickly, next November's election will either save America or break her. The Lewis family has determination, and that's a great asset. Never give up. Well that is just the way it goes sometimes. Better luck next year! homesteading is hard work and alot of learning by experience and mistakes...i have never tried growing wheat but i have tried other crops like asparagus...peaches and pears, strawberries......and with each wildbrained idea i had i learned some valueable lessons. the first and most important lesson for me was to forget dangling deodorant soaps on all the fruit trees..the deer and the rabbits and the squirels and the raccoons dont care. second lesson was to plant inside the chain link fence. and my third lesson was to not take my failures personally but to keep right on trying. You learned, therefore none of this was a waste! It will be even easier next year. Atta girl! Two squirrels stripped my peach tree this year. We would see them run on all 4's with a peach in the mouth! Harvesting the tree took less than 30 seconds...25 of those seconds staring in disbelief that there were only 4 peaches left. In two weeks those squirrels took the tree from over 200 peaches to four. Can't shoot them varmints when you live in the city limits! It's only a matter of time until it happens to anyone growing their own. On the bright side...you have the happiest, healthiest, chubbiest chipmunks in the county! And a great supply of wheat straw for livestock bedding. Wheat straw also makes great crafts...wreathes, the cute goats and other animals seen hanging on trees or on mantelpieces in Sweden. You can also weave wheat straw into placemats and other useful items! We also learn from your mistakes Patrice. So keep teaching. Also you mentioned the wheat you purchased for Spring was treated. What was it treated with herbicide? And is the wheat a heirloom variety or hybrid? My first experimental wheat field last year was so small, I used a pair of scissors to cut the stalks. I had about 20 shocks packed into one big wheelbarrow. Between all my other summer tasks, it took me 2 weeks to thresh and winnow my tiny crop. But, I ended up with about 7 pounds of the prettiest red kernels you ever did see. I even saved back several pounds for planting the next year, which turned into this year's disaster. I'll try again next year. You're right -- The wheat harvest comes at the hottest time of the summer when I'd rather be swimming. Oh what a shame to lose the crop to chipmunks! Thankfully you are able to buy more seed. Think of the early pioneers who faced the same situation. Oh my. May you have a bountiful harvest next year. Darn those chipmunks!!! How about a barn cat or terrier?? Megan's got it. A terrier of pretty much any flavor (I'm partial to Cairns) will catch a few, and have the rest cowering at the fence line, trembling in their little fur coats. I realize that as things stand now, you may not have the heart to put an end to the cute little buggers, but keep in mind some sort of mitigation technique - terrier or otherwise - will be essential if the day ever comes when you need every last grain for food. 1] You can make tankards anytime of the year. Build up a stock during the winter and spring so you don't have to work on tankards during harvest time. 2] Find a recipe for chipmunks. Responsibility VS Response Ability. :D August can be terribly tiring. Thank you for the story. We felt like it was one of our adventures! The hard work and determination pay off and you now have a baseline for growing wheat. The education your daughters are getting is priceless. Hopefully next year's harvest will be better. One day perhaps you can look back and laugh about the chipmunks bounty, but you should be making plans to prevent it in the future. Growing and harvesting grains, as you've experienced, is a fairly specific time management endeavor to undertake for first attempt, and even for any experienced grain farmer. I applaud the fact that your family is actively utilizing and practicing the old art skills of small plot grain planting and harvesting. Reality outcomes are much more desirable, than just assuming some process will work for you, because someone wrote it in a book and said it will work. It took us several actual seasons of practice runs performed to ensure that a successful process of planting and manual harvesting would give us enough grain yields, for our family's needs. Sounds and looks like this was a fun adventure in learning! Could chipmunks make the base for a good stew in your households menu planning? If you learned something, it isn't a failure. part of my last two jobs involved trying to vermin proof places-it's almost impossible-at best, you make a place vermin-resistant. What about 1/8th inch ratwire? I've used a lot of that stuff..
Everything always takes longer than you think it will,and something will go wrong you didn't foresee. Murphy's Law cannot be plea bargained with. Suggestion to avert a future varmint gleening of your animal feed and seed, is to transfer that seed into a sealed metal drum, or a lined galvanized garbage can. Chipmunks will chew through that plastic container in a heartbeat. Patrice, here is what you should have done... Just kidding, I wouldn't have the first clue what to do. I certainly have to admire your family's attempt at making a go at this. hopefully you'll have better luck the next time around. here's another blog i read, and here's what they did while experimenting with wheat. i don't agree with their social views, but for farming, they seem to know their stuff! Thankyou for posting this :) It's all a learning curve, thankfully we have the luxury to make mistakes and learn from them without it being a life and death situation. We haven't planted a wheat crop yet, tried maize out and it went pretty good but we haven't ground the grains yet or tested out if the seed from that crop is viable. So much to do, so little time (and energy)! Good luck with the next crop! Patrice! You have now discovered why farmers of the past had large families. I have 12 aunts and uncles on my father's side alone! It took that many hands, not including hired help during certain harvest times, just to keep things nailed together. I was lucky enough to get to read the old hand written records of the town's general store after it closed. Entries of the items bought from Granddad are among the more numerous. At first I was feeling sorry for your unfruitful harvest. But you know what? I'm so glad that you weren't DEPENDING on that harvest for your family and that you can try again next year. Those lessons will not be soon forgoten! 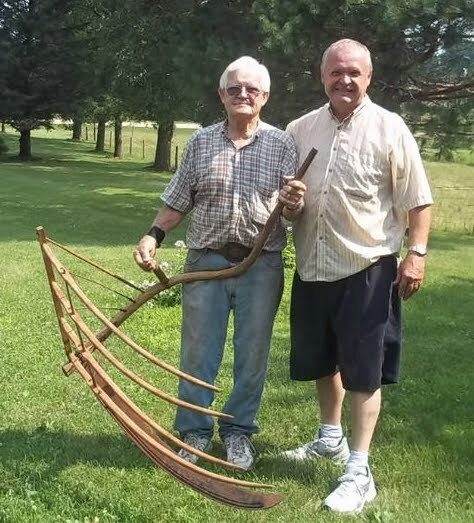 Patrice, how about starting with an austrian scythe. They are much lighter easier to use and you can lay the wheat down in wind rows. A place called the One Scythe Revolution can get you all the info you need. About the chipmunks, a hungry cat or terrier may be the best solution. Best of luck, we will be doing the same experiment next spring. I tried an experiment this year that didn't work out. We have a vanilla (orchid) that bloomed. Lots of blooms. Not living in Mexico where the V. planifolia is native you must hand pollinate if you want seed pods. The flower is quite complicated and is pollinated by a small wasp in Mexico. Well, I tried with a lot of the blooms. Only had one take and got a nice looking bean and watched it all summer. We were so excited! Left it on the vine too long and it went to seed. Failure. I was actually going to try to cure it and end up with a vanilla bean for cooking just to see if I could. Found the instructions for both how to hand pollinate and how to process the "bean" online.